Former astronaut Buzz Aldrin and astrophysicist Stephen Hawking are teaming up to help advance humanity's future in space. One of the world's leading astrophysicists has teamed up with one of the first humans ever to walk on the moon to help plot out humanity's future in space. 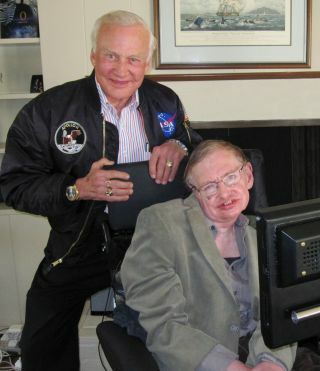 Renowned physicist Stephen Hawking and Buzz Aldrin — who in 1969 became the second person to set foot on the moon — have joined forces in an effort "to better mankind's future in space" after a recent meeting in Southern California, according to an announcement. Details of their plans are sketchy at the moment, but the pair are dreaming big, with nothing less than the survival of humanity on their minds. In a joint statement, Aldrin and Hawking said that their collaboration "seeks to define and obtain a Unified Space Vision that will continue the expansion of a human presence in space and ensure the perpetuation of the species." The definition and promulgation of such a vision will help humanity better manage its affairs on Earth, they added. And it will help lay the foundation for the establishment of human colonies throughout the solar system. Such big tasks are beyond the abilities of any one country, so cooperation is key, according to Aldrin and Hawking. "This unified vision will encourage global leadership," they said. "As nations approach the endeavor jointly, rather than in the competitive playing field of the past, each nation will contribute its own special strengths and resources." Aldrin has been a vocal supporter, for example, of President Obama's vision for space exploration, which would task NASA with getting astronauts to an asteroid by 2025 and Mars in the 2030s, rather than focus on returning to the moon. Despite suffering from the neurodegenerative disease amyotrophic lateral sclerosis (ALS; also known as Lou Gehrig's disease), Hawking remains one of the world's most prominent astrophysicists. He has also publicly pondered humanity's place in the universe — especially whether or not we are alone. Hawking made some waves last year by suggesting in a televised science program that our species shouldn't be so unqualifyingly eager to make contact with advanced alien civilizations. There's no guarantee that such aliens will be friendly, he stressed — it's possible they may want to strip-mine our planet for resources rather than make friends. The recent meeting between the two space pioneers apparently made a big impression on Aldrin. "I've always tremendously admired Stephen Hawking and the impact of his work on increasing our understanding of the universe," Aldrin said. "Our three-hour encounter was of the most wonderful and unusual kind, with a bit of delving into the mysteries of stars."